Former Vancouver Magazine editor and now the Vancouver Sun gossip columnist Malcolm Parry coined the expression “the privileged view”. For him if you saw a very tall building you had to be on the roof to look down to have the view that is exclusive. He taught me to avoid, as a photographer, that which was not privileged. I learned to photograph rock bands and other musicians backstage and never up front on the concert stage. 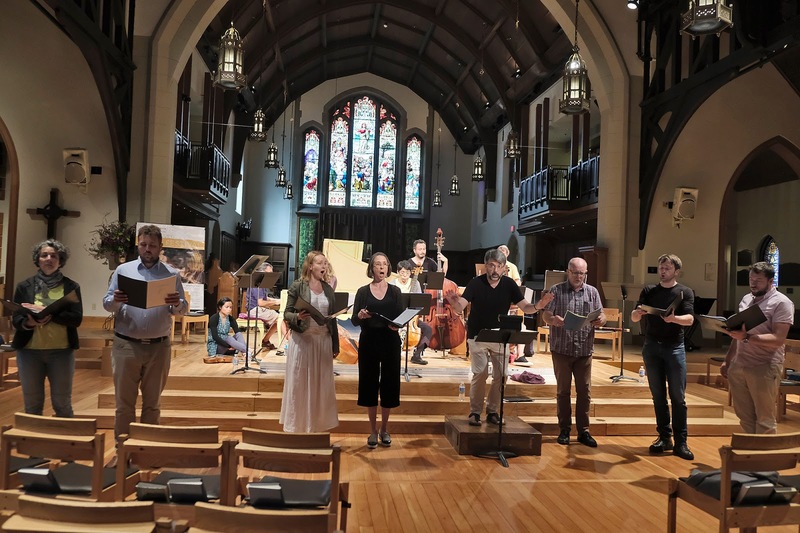 One of my entries into Parry’s privileged view in music is by helping billet Early Music Vancouver musicians from abroad in our Kitsilano home. From these musicians you get the inside goods and you are able to do what I did yesterday in the afternoon which was to take Gli Angeli Genève bassoonist Philippe Miqueu to the rehearsal for last night’s concert Bach Cantatas: Actus Tragicus at Christ Church Cathedral. The sold out concert was part of that great Vancouver/ Early Music Vancouver tradition our summer Vancouver Bach Festival which still has one more week to go. We arrived at 4 and the rehearsal was supposed to begin precisely at 4:15. The director of Gli Angeli Genève, Stephan MacLeod (sporting sandals, sans socks, perhaps in solidarity to former Early Music Vancouver Artistic Director and Founder José Verstappen) was late. My first impression was that here you had a Swiss timepiece emulating an American Timex with a rundown battery. Thinking about it with all that holiday rush traffic I understood his lateness. I was able to observe from my privileged position a kind man who communicates with his group (in whispers) in the necessary languages of French, German and English. Curiously there was something new for me. I have seen violinist and leader of all kinds of world musical quartets and groups, Marc Destrubé direct and orchestra while playing a violin. One of his techniques is to bend his feet on his toes upwards. The result is that many of his concert shoes are decidedly curled upwards. 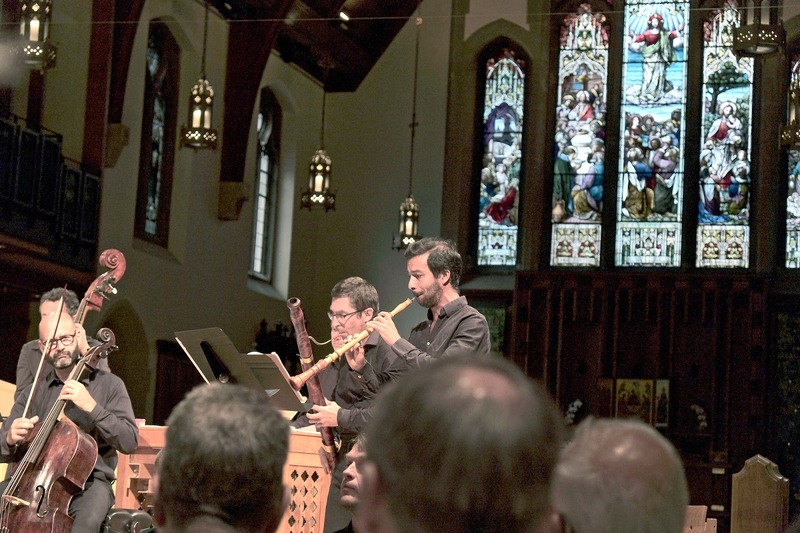 I have seen a virtuoso harpsichordist (and keyboardist, too) Alexander Weimann, the director of the Pacific Baroque Orchestra, conduct it while playing the harpsichord standing up. But this was the first time I have seen an unusually handsome voice bass/baritone, Stephan MacLeod (founder of the group) direct while singing. The first change is that the order, from left to right of sopranos, altos, tenors and baritones/bass is modified with the baritones/bass singers in the middle. I was privy to a further fascinating event and this is MacLeod’s pleasant obsession with the direction and loudness of sound. Various times he instructed his singers not to be so loud. But what was interesting was how he moved some of his singers, especially countertenor (sometimes called male altos) poker-playing-faced Alex Potter to an extreme stage right. Macleod is into voice separation not into a mishmash voice blend. At one point in order to project sound better he had violinist (she is not all that tall) Anïs Chen stand on a riser. During the evening's performance I enjoyed moments of extreme quiet in which the singers were barely audible and I could hear, clealry, the recorders of Bart Coen and Jan Van Hoecke. All the time I watched a man of precision become passionate with his instructions. My guess is that while the group is based in Geneva, the combination of musicians from many parts of Europe and the fact that Switzerland has the elements of Italy, Germany and France, it is able to draw from those cultures all that is convenient. In the pre-concert talk the slim MacLeod explained why his singers come in twos to a final count of 8. Eight can project individuality and with skill the opposite. It is more difficult to do that with more singers. Going back to the idea and pleasure of hosting visiting Early Music Vancouver musicians is the fun my Rosemary and I have in conversing (I like the word conversar, to speak in verse that we use in my native Argentina) with musicians who, like architects and artists, are well-versed in a variety of subjects. Furthermore it is a pleasure to show these musicians three elements that we have as a plentiful bonanza in Vancouver (and certainly lacking in some other countries of the world) which are air, space and water. But it is also fun to “corrupt” them nicely to stuff that they may not have experienced before. Philippe Miqueu brought his clarinetist wife Fabienne (alas no clarinet parts in Bach!) 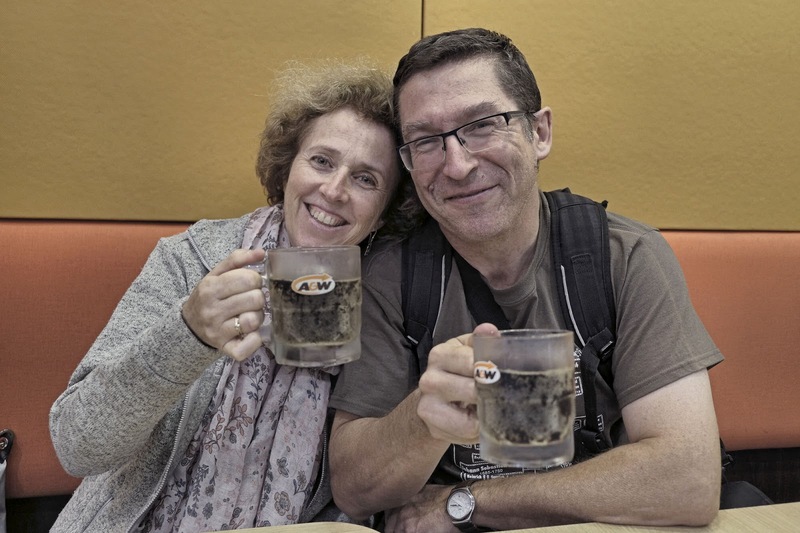 along, so when I took them to town, as we were walking by Robson Square I asked them, “How would you like a root beer?” The word beer was music to their ears. And so we had frosty root beers at A&W. I am sure this was their first time! Yes I loved Bach’s Gottes Zeit ist die Allebeste Zeit Cantata BWV 106 particularly in Versus 2 that featured countertenor Alex Potter, and how he was moved to extreme stage right in Versus 4 and 7. I loved Cantata BWV 131 “Aus der Tiefen rufe ich, Herr zu Dir”. But the best for me was twofold. In Georg Phillip Telemann’s “Du aber, Daniel, ghe hin” Funeral Cantata tvwv4:17 which has many unusual (and dark) arias and recitatives for Stephan MacLeod’s bass/baritone voice (an elegant one) right there almost at the end (like a ray of light) there was an aria, Brecht, ihr müden Augenlieder sung by soprano Aleksandra Lewandoska (she and smiling tenor Thomas Hobbs I have seen before here both came in August 2017 as did also Alex Potter ). The aria was happy and more so watching Philippe with a big smile on his face playing his bassoon while bending his knees up and down. When I told him that his performance in that aria reminded me of Lawrence Welk he was puzzled! After listening to many versions of this aria on YouTube I can assure you that Gli Angeli Geneve’s is the best. And probably this is because of the performance of Emmanuel Laporte’s oboe in conjunction with Philippe Miqueu. Felix Knecht, violoncello, Philippe Miqueu, basoon & Emmanuel Laporte, oboe. And there was to be, as in that Canaan wedding, the best wine appearing in the end an encore of Buxtehude’s BuxWV062 passacaglia which since I love all folias, chaconnes and passacaglias was fantastic. One minor wrinkle is that oboe player Emmanuel Laporte was sitting down behind and did not play. An explanation for the funny faces of the first picture illustrating this blog is as follows. 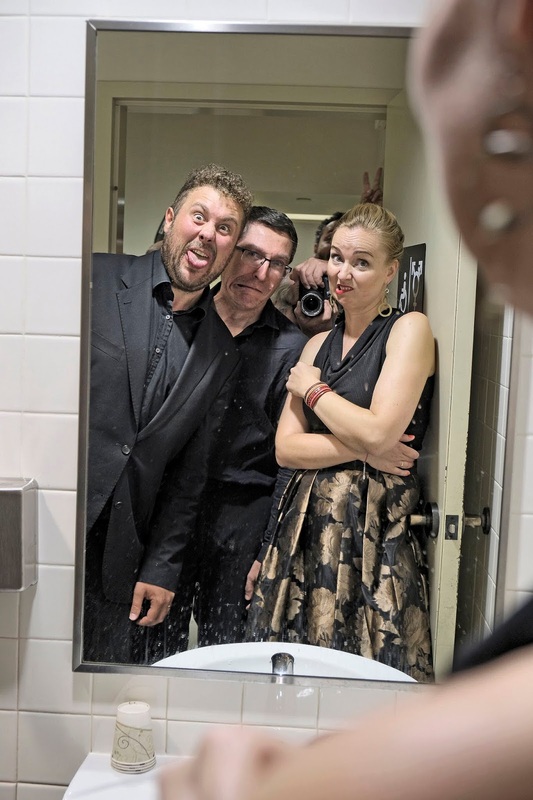 After I took two photographs of the three serious musicians it was Alex Potter who asked, "Can we do something silly?" They did. In that above concert you can enjoy Vancouver's Turning Point Ensemble (and Capella Borealist trombonist) Jeremy Berckman play the instrument's ancestor, the sackbut and with three more sackbut players. with Alex Potter and Thomas Hobbs accompanied by Alexander Weimann on the piano. And on Friday August 10 at the Chan the festival closes with Bach Trauer Ode BWW 198 with all Gli Angeli Genève soloists and the Pacific Baroque Orchestra.